Tucked into a cleft of rock along the North Yorkshire coast, Staithes is based around a naturally occurring harbour cut into the rock by the sea. The town has a somewhat picture postcard appeal, with its white washed cottages dotted haphazardly around the bay. 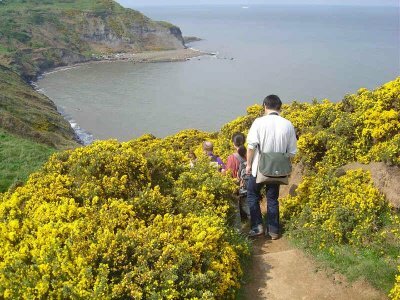 The surrounding scenery is stunning, the rugged cliffs that line the coast will not disappoint anyone looking for great views on this walk. The walks destination is Whitby, a historic town situated at the mouth of the River Esk on the North Yorkshire coast. It is well known for its abbey that sits on the cliff top over looking the town, not to mention its connections to Dracula as this is the location where his ship was washed ashore in Britain.